Arsenal kept pace with the pack chasing the Champions League qualification spots thanks to a 2-1 win away at Jan Siewert's hardworking Huddersfield Town on Saturday. 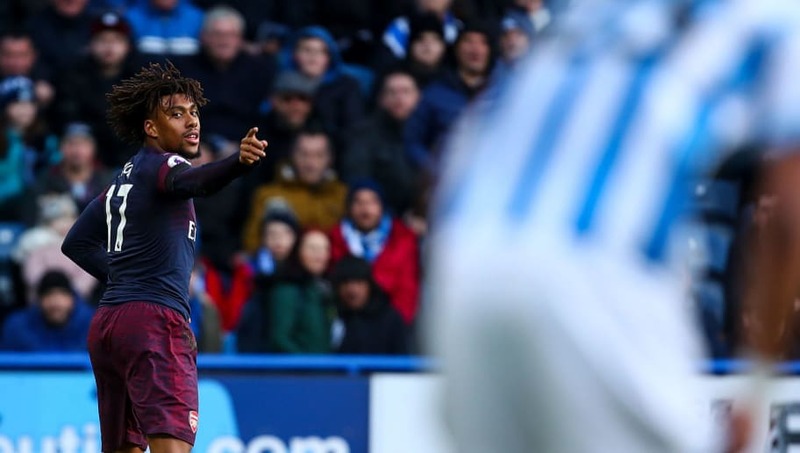 Unai Emery's side wasted no time in getting a foothold in the match and their pressure eventually paid off when Alex Iwobi's deflected volley deceived Huddersfield Town goalkeeper Ben Hamer, who was left wrong-footed. Alexandre Lacazette made sure of the three points just before half time with a simple finish at the back post following brilliant play from Henrikh Mkhitaryan and Ainsley Maitland-Niles on the edge of the penalty area. Adama Diakhaby was denied his first goal in Huddersfield colours when goalkeeper Bernd Leno scrambled across his goal to maintain his side's two-goal lead. Iwobi, Mkhitaryan and Maitland-Niles all had chances to put the icing on the cake for Arsenal but were wasteful in the final third, while the clinical Lacazette struggled to get on the end of chances in the second half. Jan Siewert's side saw a chance cleared off the line late in the match but they were able to eventually break through thanks to an own goal from Sead Kolašinac, although the hosts weren't able to push on to rescue a draw. Check out our roundup of the game below. Huddersfield came into the game without finding the back of the net in over eight hours of Premier League football and that run has finally ended, although it was actually an Arsenal player who scored their goal. Arsenal are the only team in the PL without an away clean sheet this season. Huddersfield have only scored 13 goals in the league this season and scoreless in the last eight and a half hours of football in all competition. They also have the worst home record in the league. So Huddersfield have gone a long time without scoring a goal... The team you'd most want to play against in that situation would most definitely be Arsenal. We don't do defense. The Terriers had a great chance to break their duck and gain some confidence in front of goal, even though anything other than a defeat was always unlikely, but new manager Jan Siewert will still be scratching his head over who he should select in the attack. Starting XI: Hamer (5); Smith (6), Zanka (6), Schindler (6), Kongolo (7); Mooy (7), Hogg (7), Bacuna (5); Diakhaby (7), Puncheon (5), Kachunga (6). Substitutes: Durm (6), Depoitre (7), Grant (6). STAR MAN - Aaron Mooy's return to Huddersfield's first team didn't quite provide what many fans had hoped against Arsenal this weekend, but the Australia international was the spark for most of their attacking play on Saturday. The 28-year-old was a workhorse in midfield alongside Jonathan Hogg and they were arguably a better partnership that Arsenal's Lucas Torreira and Matteo Guendouzi, but the visitors just had too much going forward for Huddersfield to deal with. WORST PLAYER - Ben Hamer had the chance to stake a claim for the starting spot on Saturday, but the former Leicester star failed his test in West Yorkshire. The 31-year-old was non-existent throughout the match and didn't fill his defenders with any confidence at all. Although he was wrong-footed for Arsenal's opening goal, Hamer didn't cover himself in glory with his half-hearted attempts to keep Iwobi's effort out of his net. The phrase "Arsenal have a clean sheet" is a saying which hasn't been used in about 156 years (or at least it feels like that anyway) and still fans are waiting for their side not to concede on the road this season. The Terriers hadn't scored since January 2 but a late own goal from Kolašinac left a dampener on what was otherwise an important and decent showing from the Gunners. Starting XI: Leno (8); Maitland-Niles (7), Koscielny (7), Mustafi (6), Monreal (6) Kolasinac (6); Guendouzi (5) Torreira (6); Mkhitaryan (7), Iwobi (9) Lacazette (8). Substitutes: Elneny (6), Suárez (6), Willock (N/A). STAR MAN - Alex Iwobi's fine form in recent weeks continued on Saturday as he put in a top display against the Terriers. The Nigerian, as well as Henrikh Mkhitaryan, caused the hosts all sorts of problems playing just off Alexandre Lacazette. We tried to warn you. Alex Iwobi let loose from the shackles of defensive managers would tear the Premier League apart. Iwobi under Unai Emery should be illegal. Iwobi and Mkhitaryan have been brilliant today. The 22-year-old was at the heart of Arsenal's dangerous counter attacks and his direct style of play kept Huddersfield on the back foot throughout the game. He also scored his first goal for the club since before Christmas. WORST PLAYER - Mattéo Guendouzi has been a breakout star for Arsenal this season and he's taken no time at all in winning over the fans, but Saturday's performance in West Yorkshire was arguably his worst so far for the Gunners. The 19-year-old was sloppy in possession and made a lot of mistakes that you would expect from a teenager, but that so far Guendouzi hasn't shown signs of during his fledgling Arsenal career. Fortunately for the France Under-21 international, his below-par performance didn't cost Arsenal any points and their faint hopes to finish inside the top four have been kept alive for at least another week. Huddersfield travel to Newcastle in two weeks' time with a vital three points up for grabs in the race to stay in the Premier League this season. Arsenal, following a Europa League doubleheader against BATE Borisov, host Southampton and Bournemouth on the spin before making the short journey to face Tottenham next month.